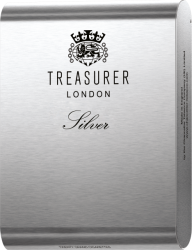 Specially selected tobacco and custom made materials are used in manufacturing "Treasurer London" Aluminum range. Absolutely no expense was spared in creating this product. 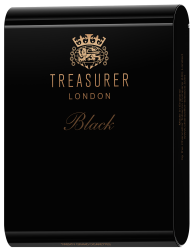 Treasurer London represents the finest characteristics and attributes of a truly great Virginia blend now sought after by connoisseurs in over 30 countries around the globe. A stylish aluminum pack which contains 20 cigarettes is uniquely shaped and designed to be in keeping with the 21st century. Each pack is sealed with a unique hologram tear tape to guarantee authenticity. Inside the pack, the cigarettes sit beneath an embossed foil leaf cover, while a special card emblazoned with the Chancellor Tobacco Crest separated the two rows of this unrivalled cigarette. 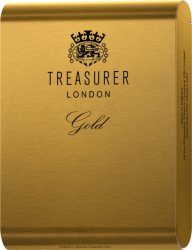 Laser-cut micro perforated tipping paper is stamped with "Treasurer London" logo and specially produced cigarette paper is printed with the "Treasurer London" crest. The result is a mark of grandeur, signifying superlative taste and absolute exclusivity. Each outer contains 5 aluminum packs of 20 cigarettes. Each master case contains 40 outers of 4000 cigarettes. Our gift to those who seek the very finest things in life.